This is a rather...interesting recipe, but good nonetheless. This sushi-flavored appetizer is easy and quick to make, and could provide great finger foods for your sushi-loving (and willing to experiment) friends. Edamame is cooked, and half is pureed with green onions, miso paste, and pickled ginger juice (you know, the stuff that comes served as a palate cleanser next to the wasabi), producing a bright green, densely textured concoction that looks similar to guacamole. Then the remaining edamame and more green onions are mixed into the puree, and you're done. The flavor is definitely that of sushi. The sweetness of the edamame and ginger juice plus the salty richness of the miso makes for quite the unusual combination. It's a flavor that's great in the beginning, okay after a few, and something you wouldn't want any more of after a while. 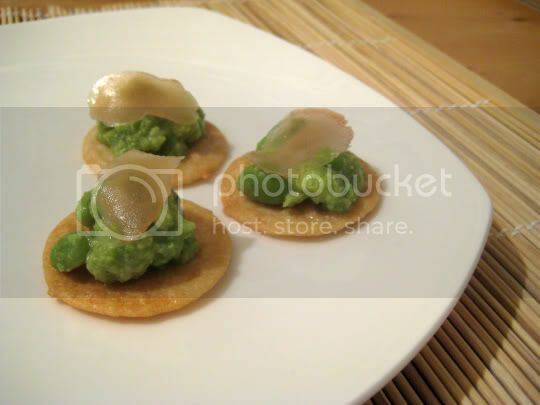 For assembly, place a dollop of the edamame mixture on top of a wasabi rice cracker (I had to go to Whole Foods to find these) and top with a pickled ginger slice. Instant sushi! Well, sort of. If you must go out of your way to find wasabi crackers, do it: they add to the sushi experience even more, with just that tiny hint of heat you would expect. Make again? Yes, but only for the sushi lovers.